Seeing as how this is my first review, I’ll share a relevant story with everyone to help give some insight into my biases and collecting personality. Before finding this site, I hardly knew what chogokin meant. I had seen SOC’s before in comic shops but never knew what it signified, nor the fervent fan base behind it. After reading so many reviews of awesome die-cast toys here, I was sold. I wanted to experience this unknown sense of toy collecting joy. So I came across an Aoshima chogokin Getter 1, the weathered variant, for cheaper than retail. I really love that design of Getter 1 and I was eager to have some die cast, so I ordered it. When it arrived I was ecstatic. I slowly removed the Styrofoam tray, held the Getter in my hands, felt the cold weight of die cast weigh into my palms, heard the ‘click’ of detented joints --- and immediately repackaged it and flipped it on eBay for a small profit. Point being: I’m not meant for chogokins. I didn’t grow up in the 70’s, so the nostalgia’s not there, and the figure felt fragile and foreign in my hands. It was at this moment that I realized how much I really loved vinyl. The texture, the smell (Yes, the smell); that's what brings about a feeling of toy satisfaction from me. This is honestly the single most expensive toy I’ve ever purchased. 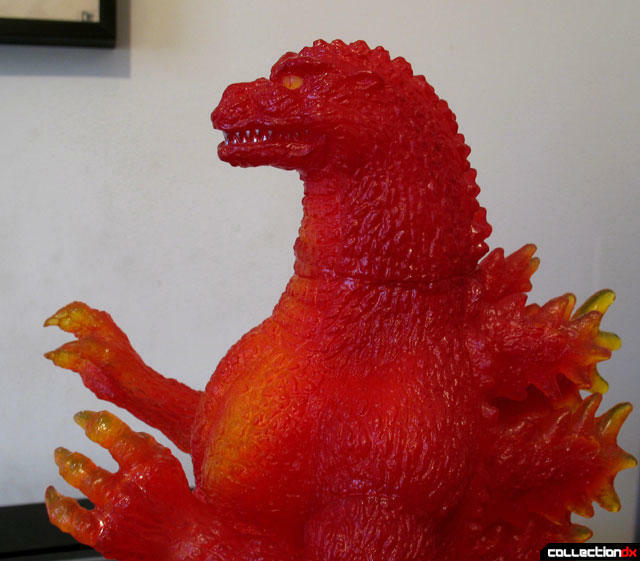 Burning Godzilla’s cast in translucent yellow vinyl and painted with translucent red. The only color variation is the teeth, which are bright silver. On the bottom of the right foot there are sculpted copyrights and on the bottom of the left foot “CCP” is printed in white letters. 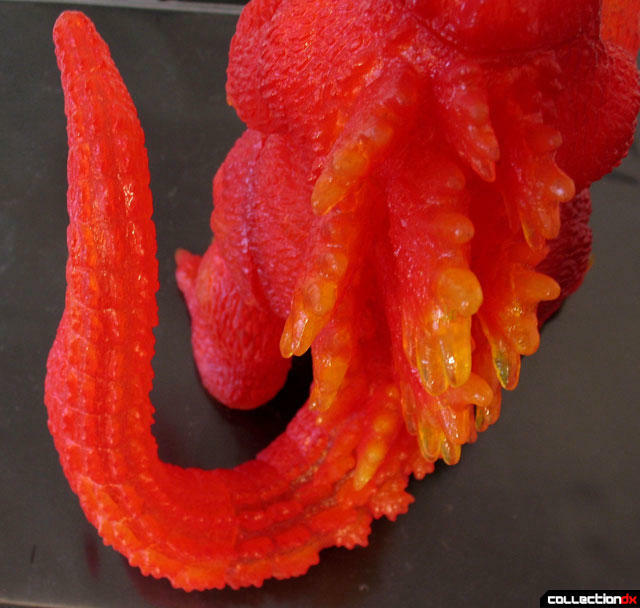 It’s 9.5 inches tall, 6 inches wide, 8 inches long and articulated at the legs only. 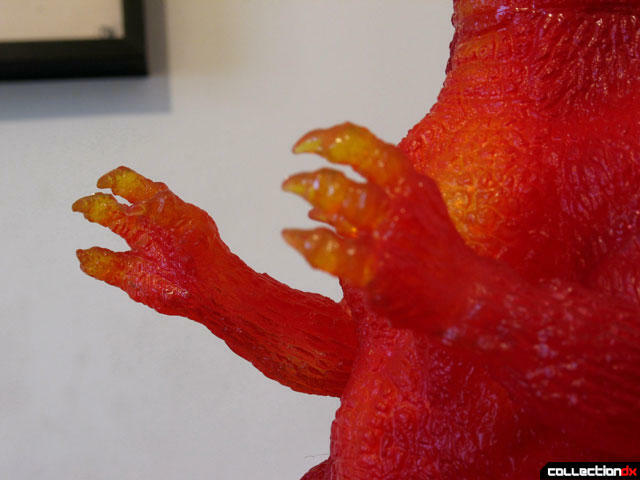 The toy also features a gimmick shared by some other CCP kaiju: Give it a good whack or shake and a series of white LEDs in the legs, abdomen and chest flicker brightly. They can actually be set off separately if you hit it correctly. The colors transition very well and have a subtle glowing appearance in normal light, but when lit up the changes between yellow and red are striking. 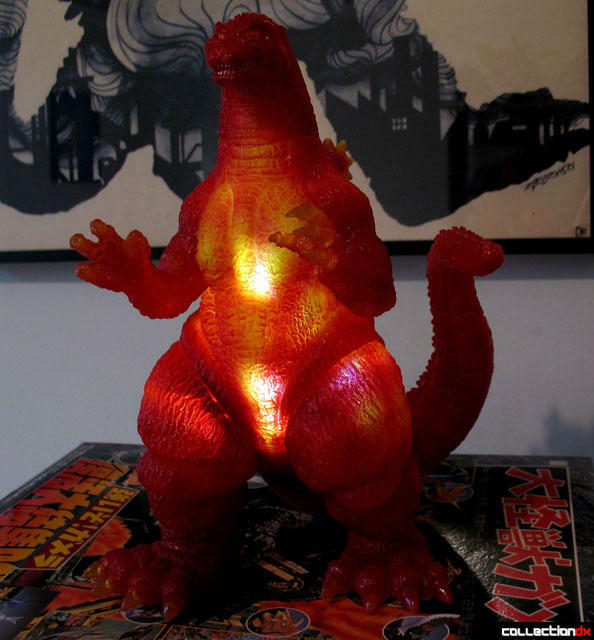 There’s another version of this sculpt that’s cheaper, doesn’t light up and is cast in dark gray vinyl as ‘normal’ Godzilla 94’ but I would immediately recommend the burning version over it; The presence of this figure is fantastic. 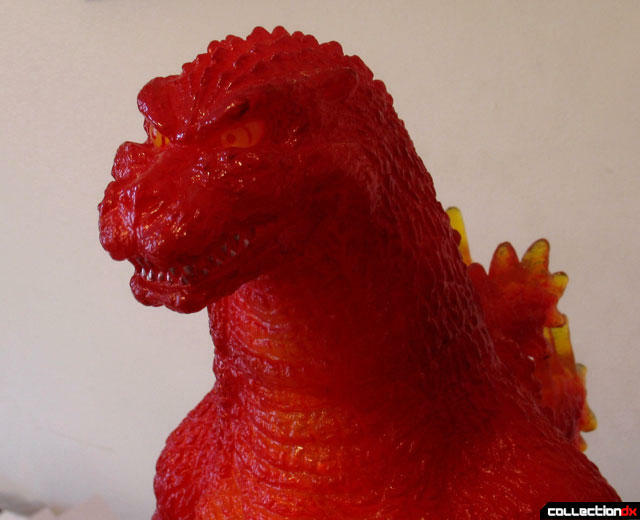 In terms of sculpting, the detail of the scales is great but not necessarily better than most Godzillas. What immediately stands out is the posture. The tail looks to be in mid-swing, returning to Godzillas back, and the spines look to be shifting, carrying a sense of movement, as if they’re actual extensions of bone set in flesh (Or hard-rubber set in latex; whatever you fancy.) The figure simply roars with energy and motion, breaking away from the far more common stillness of Bandai Godzilla symmetrical spines and straight tail. But as good as those aspects are, the face may be its greatest sculpting effort. The expression is so intense. It makes it look as if Godzilla’s poised to strike (Or more appropriately explode.) The closed mouth, another Godzilla sculpting rarity, sits somewhere between smiling and snarling, bearing bright metallic teeth. There’s a notion of unpredictability, but the eyes give it all away. The eyes are filled with rage…or craziness…or some kind of crazy-rage! They’re detailed simply with red pupils and red outlined irises (similar to Black Getter Robo) but they’re very effective. Also, I’m a huge fan of any toy that encourages you to smack it; it’s so inviting and rewarding. You hit the toy and it lights up. Not only that, it can take the punishment with interest. Nothing to shed toy-collecting pretense like a good Italian-cop-movie slap to a $100+ figure. Maybe it’s because of a deeper pragmatic sense in me, but when I shell out money for a toy, I don’t want to have to tiptoe around it. I think it’s a great feature and helps to extinguish my qualms with the price. Even if I do end up feeling buyer’s remorse, I can yell out, “Stupid toy!” drop kick Godzilla in the face and watch him spastically flash in response. I do have a few gripes though. First off, the teeth on the lower jaw on the right side of the mouth aren’t painted. I don’t know if this is a common mistake, and judging from the quality of the figure I can’t imagine it to be, but it takes away from the power behind the expression that can easily be seen from the front and left sides. The articulation is standard kaiju fare and isn’t debilitating, but one particular thing is that there’s a visible seam in the neck. I normally wouldn’t be bothered by it, except that it’s not articulated. As there are no LEDs stored in the head, I think it would’ve been easy to articulate it and harmoniously flow the use of the separate pieces into the design. Finally, there’s the price. The figure originally retailed for about $85 and it can typically be had these days for about $120, which is what I ended up paying for it after shipping. The price point certainly has to do with it being of a limited production run and it being sold as designer vinyl, but even with the light-up feature it could’ve been more forgiving considering the materials used. That being said, I don’t regret the purchase at all. This has immediately become one of my favorite toys I own. It’s incredibly vibrant and animated in both color and sculpt, especially with the addition of the LEDs. The quality of construction and the use of vinyl ensures durability as well. While expenditures of such a dramatic nature are very rare for me, it’s a startlingly beautiful figure to be looked at, held, and given a good wallop. They appear on eBay every now and then and will sometimes show up on Kaiju-Taro.com. If you have the money, or if you sell some lesser-loved toys to afford it (always recommended), get it. Like the CCP Burning Godzilla, you’ll explode with happiness! Great first review! 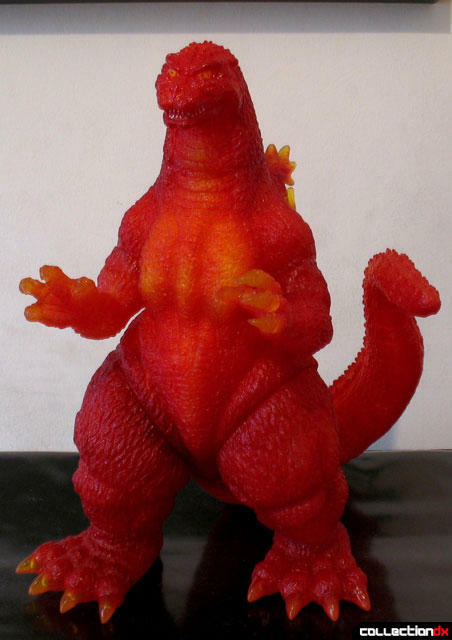 I can't say I've ever been overly impressed with these all red Godzillas but they sure are popular. Those flashing features are a neat touch, though. Great writing and subject, spoken like a true Vinylphile! Welcome and excellent review of a great piece! It's sorta tough to see in my avatar, but I'm fawning over CCP's giant (standing), battle-damaged glow Hedorah, another great light-up piece by these guys. Definitely nice to see more vinyl kaiju on CDX!